#13999 Tea or games table made from recycled northern elm. The top is 90 cm square and then table stands 89 cm high. #13580 A carved hall table dating from the early 1900 and made from northern elm. From Shandong province, it is 154 cm long, 33 cm deep and 89 cm high. 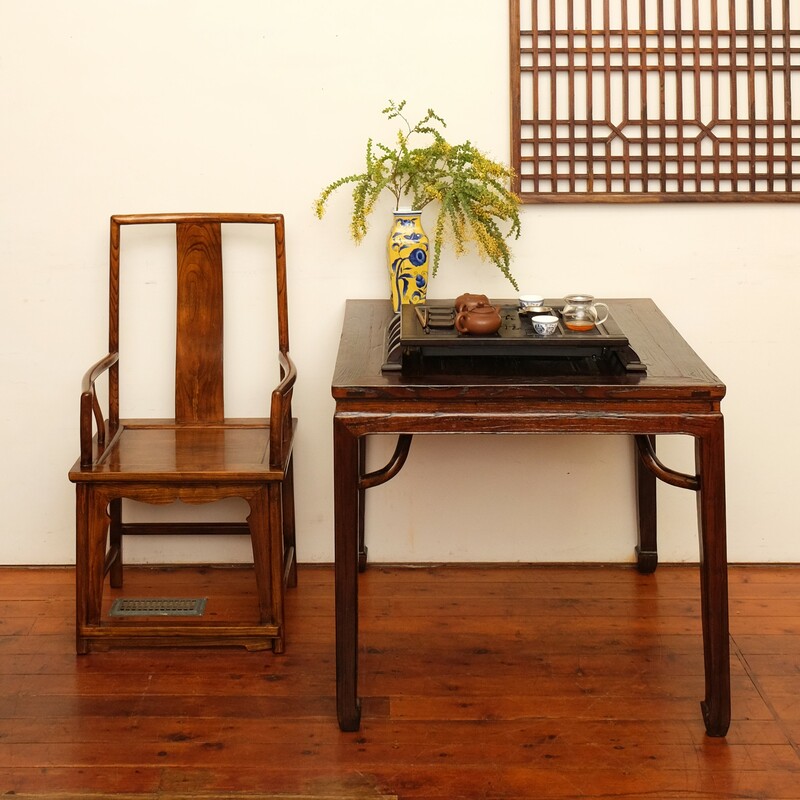 # This folding travelling table from the early 1900s measures 75 by 34 cm and stands 28 cm high. 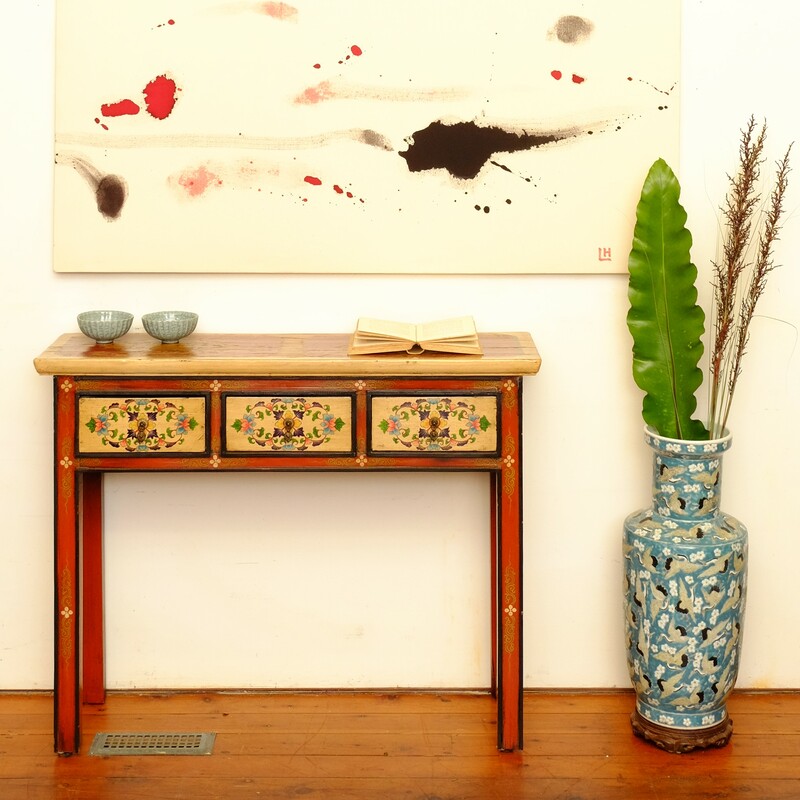 #13225 This 3-drawer hall table has been made from recycled elm. 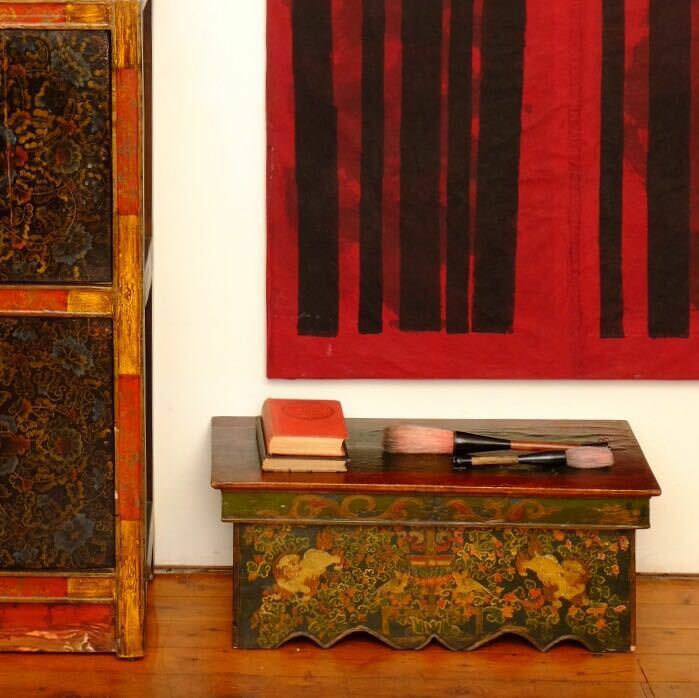 The carved and gilded drawers were made from an early 1900s screen. It is 96 cm long, 32 cm deep and stands 86 cm high. 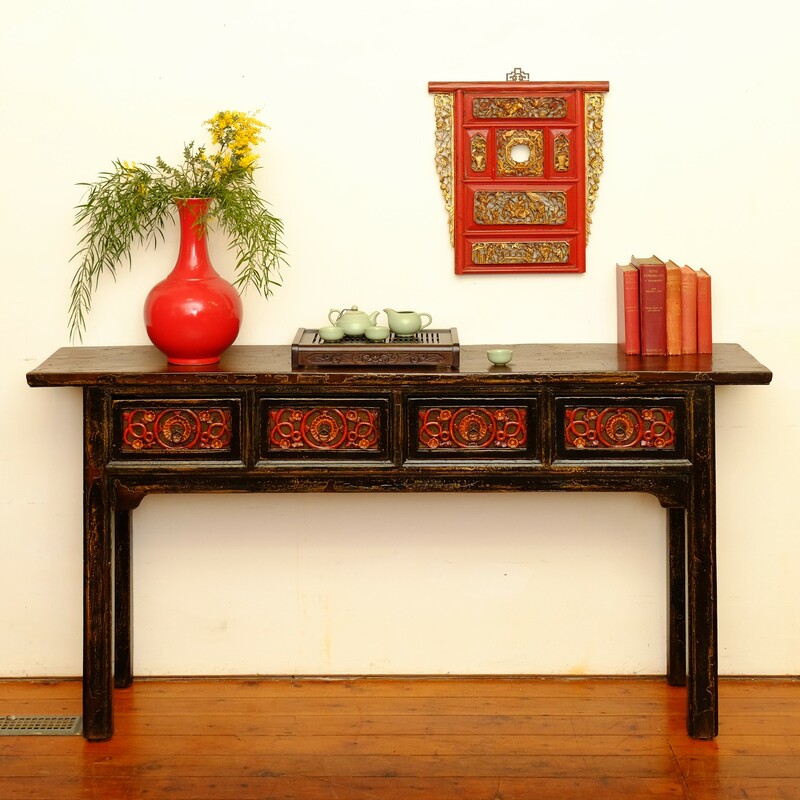 This charming country-style 3-drawer painted Tibetan table dates from the early 1900s. 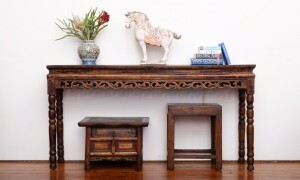 Made from Willow wood, it is 106 cm long, 32 cm deep and 83 cm high. 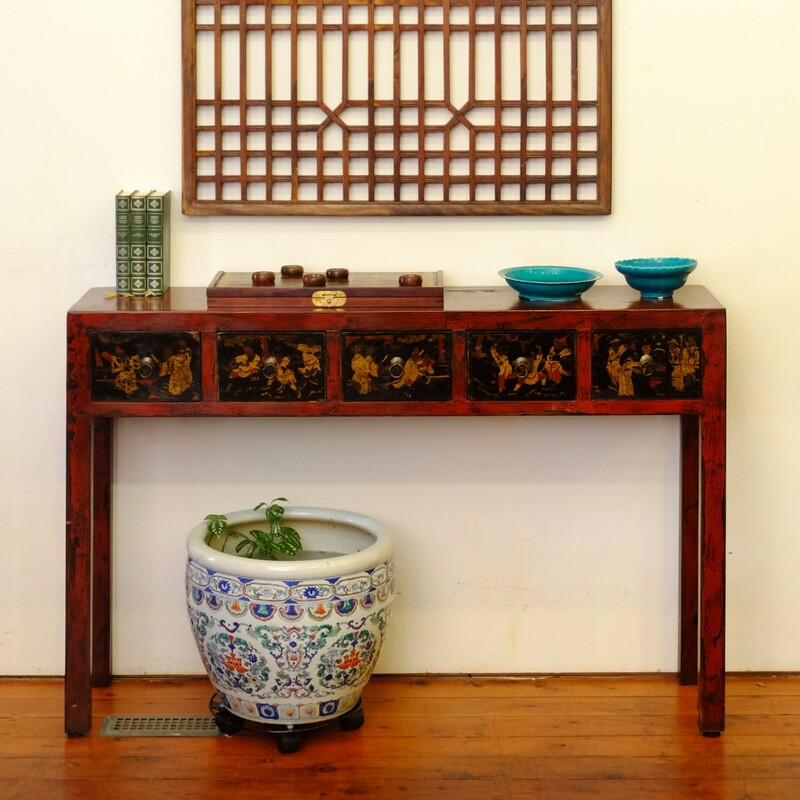 #101003 This 4-drawer side table from Shanxi province is made of Northern Elm and dates from the late 1800s. It measures 176 cm long, 36 cm deep and 86 cm high. 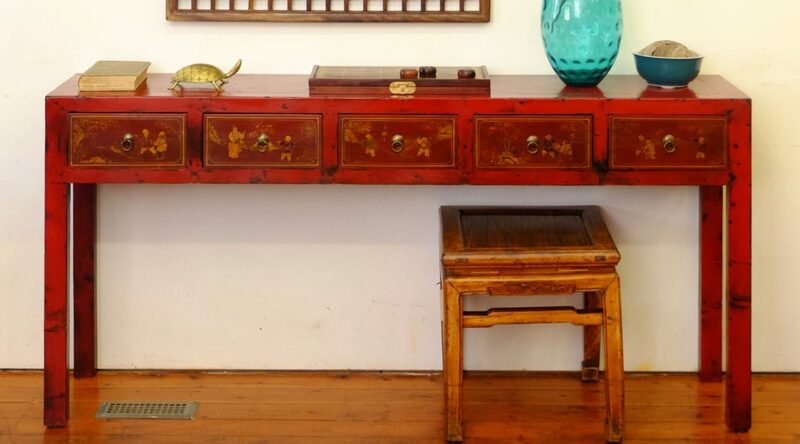 #15091 is a 5-drawer hall table hand made from 100-year-old painted fir panels and recycled elm. It measures 180 cm long, 38 cm deep and 85 cm high. 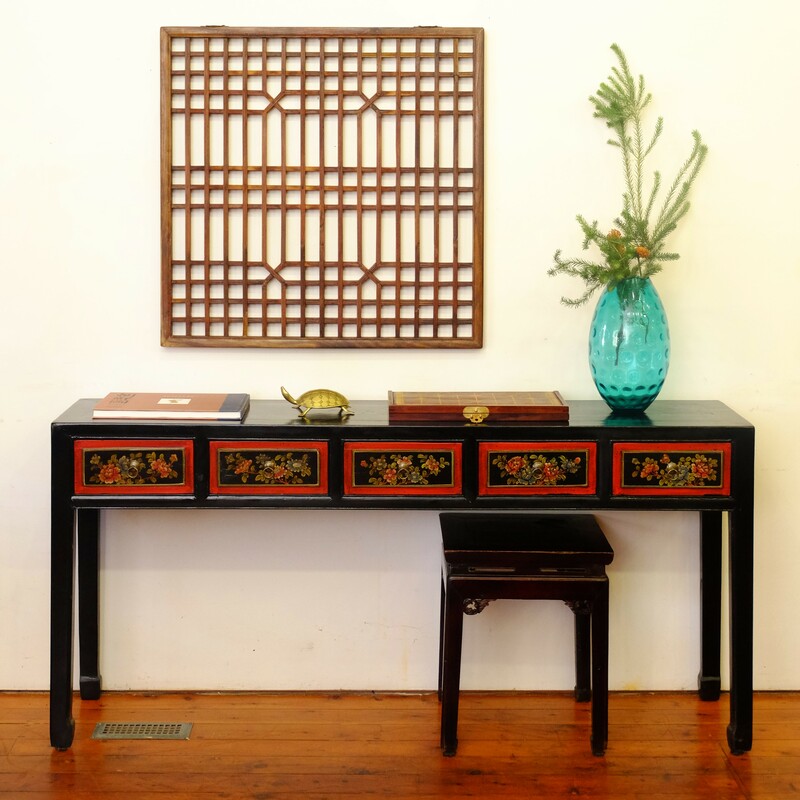 #15090 is a 3-drawer hall table hand made from 100-year-old painted fir panels and recycled elm. It measures 145 cm long, 38 cm deep and 85 cm high. 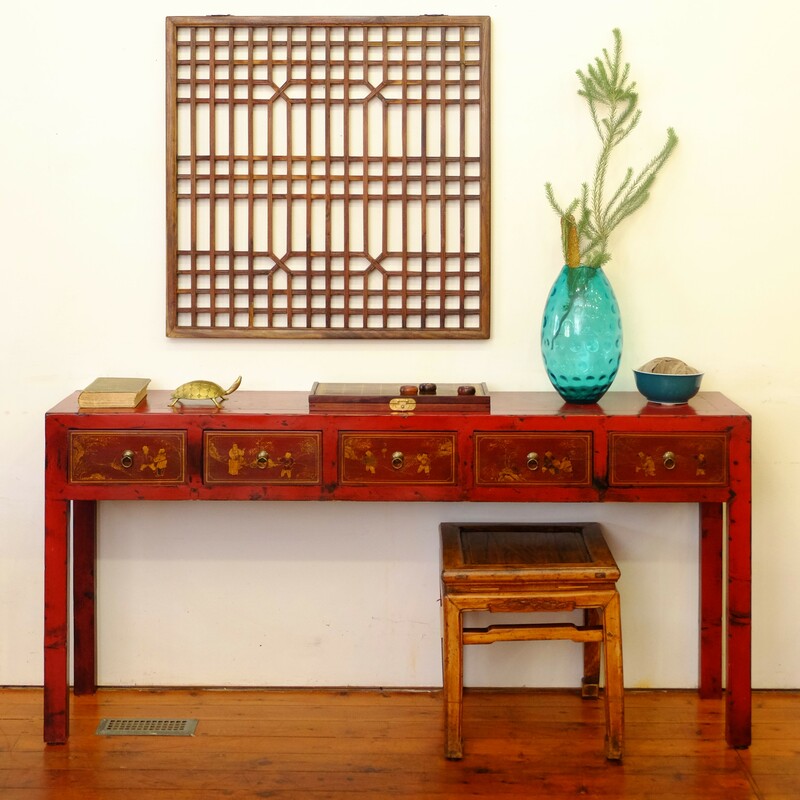 #15060 is an early 1900s 5-drawer hall table made from northern elm from Shanxi province. It isx 150 cm long, 33.5 cm deep and 77 cm high. 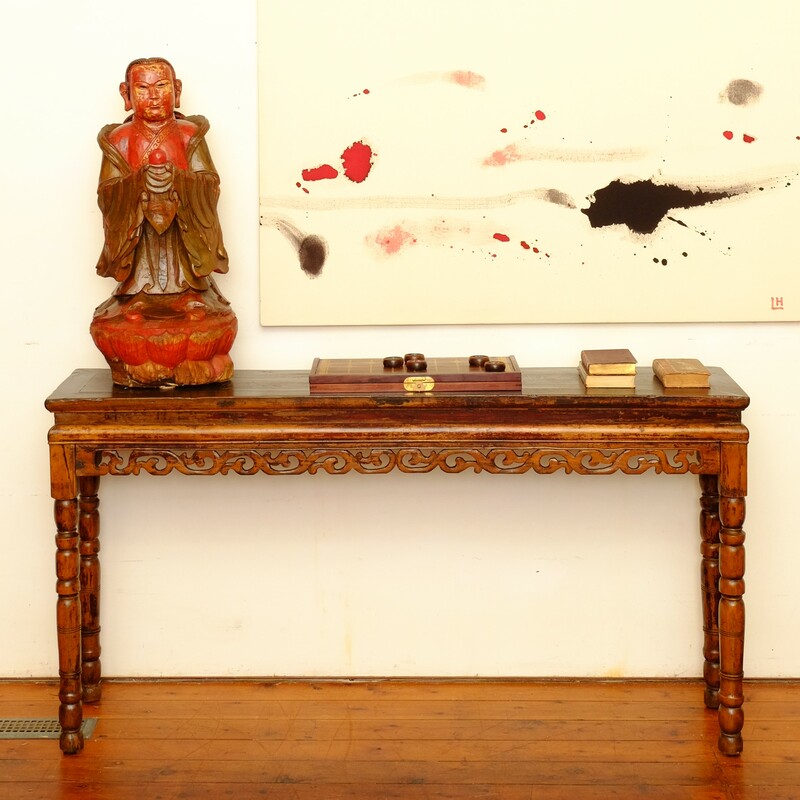 #13363 This 3-drawer carved hall table made in Fujian province from northern elm dates from the early 1900s. It is 129 cm long, 32 cm deep and 84 cm high. 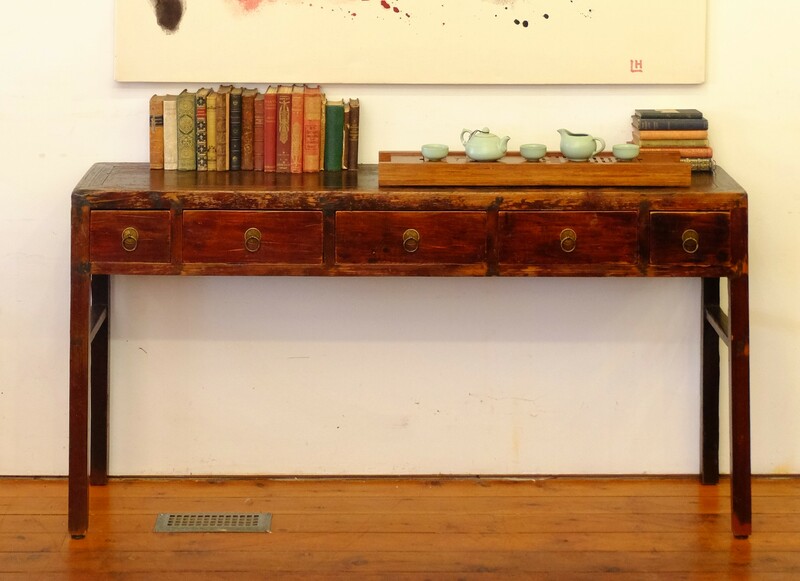 #15091 This 5-drawer hall table was hand made from 100-year-old painted fir panels and recycled elm. It measures 180 cm long, 38 cm deep and 85 cm high. 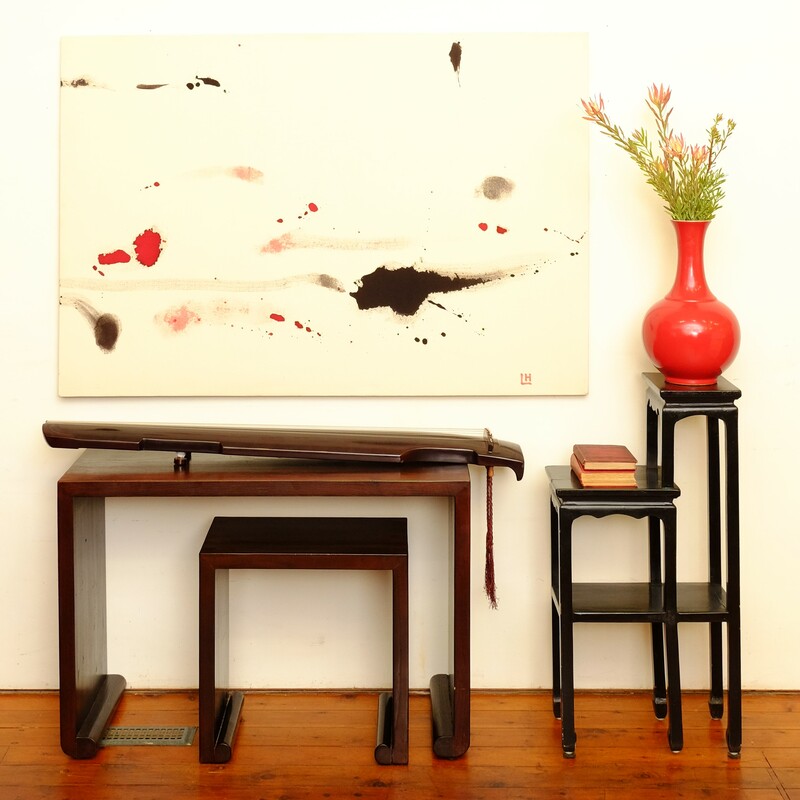 #15092 This hall table is hand made from 100-year-old painted fir panels and recycled elm. 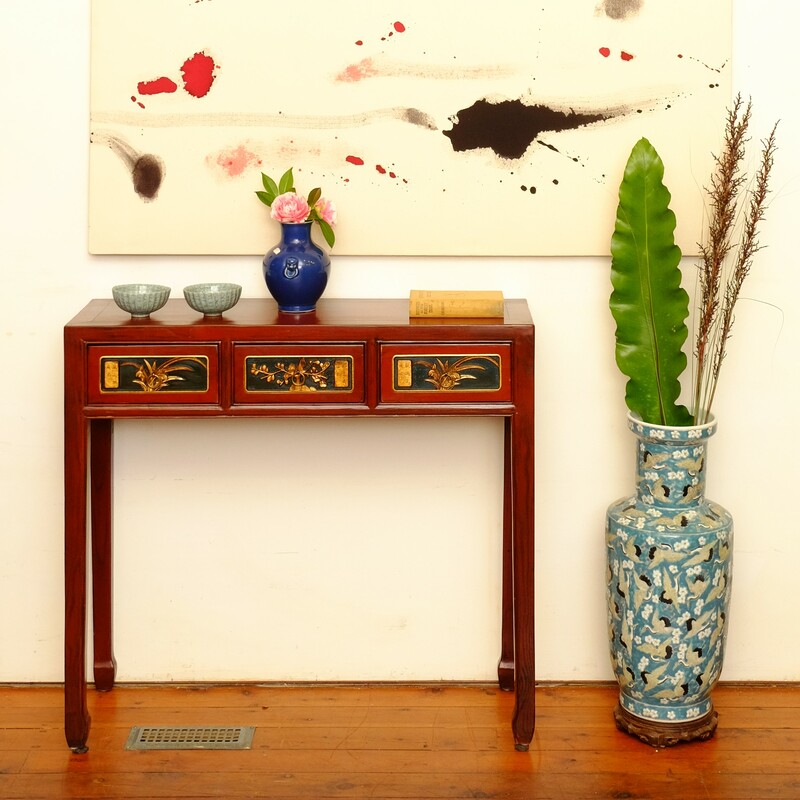 It has 5 useful drawers and is 180 cm long, 38 cm deep and 85 cm high. 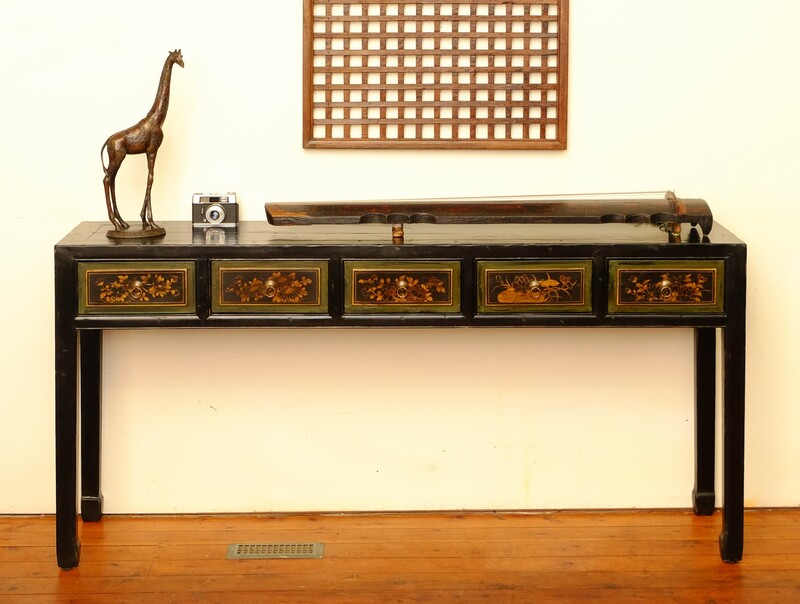 #15050 This elegant large hall table dates from the1930s. 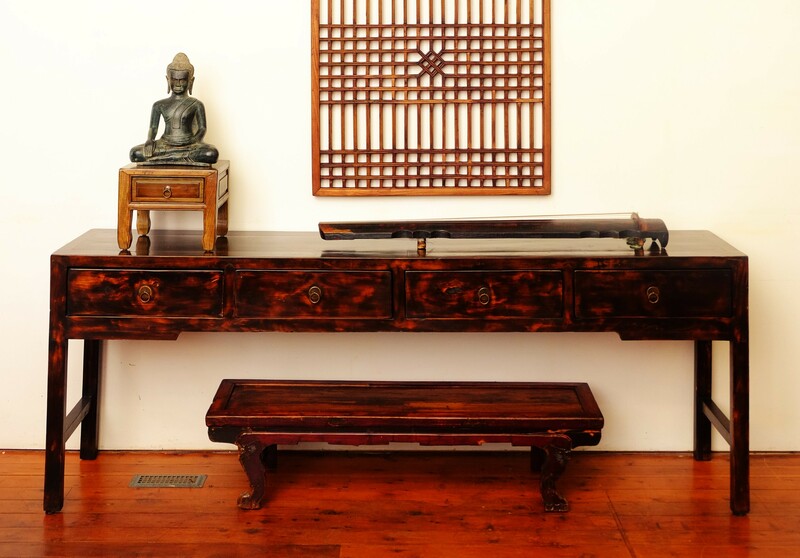 In northern elm from Shanxi province, it has four generous drawers and measures 230 cm long, 52 cm deep and 85 cm high. #13212 This small table/stool has one drawer and a “secret” compartment below the drawer that can be accessed only by removing the drawer. 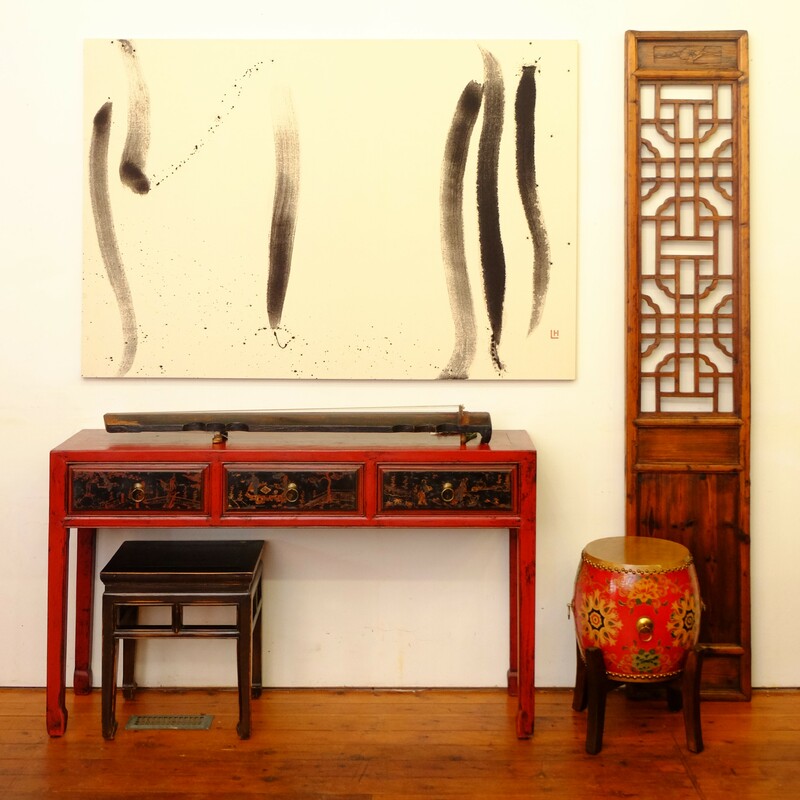 It is from Shanxi Province, made of willow and dates from the early 1900s. It is 52 cm wide, 36 cm deep and 36 cm high.